This idea is sweet all year long, but especially meaningful during the Easter season. Add a rustic wire cross to a petite clay creamer. 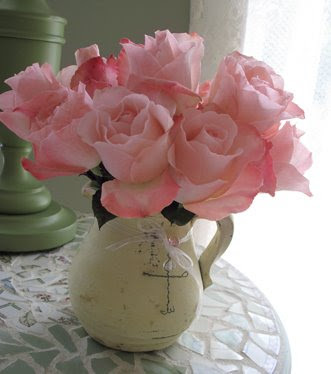 I used a vintage pale yellow cream pitcher, but you could use any simple vase you have in your cupboard. Materials: 24 gauge colored wire, scissors, 2-3 assorted accent beads, ribbon. Instructions: Take the wire and cut a piece about 7 inches long to form the vertical section of the cross. Bend in half, leaving a little loop at the bend for your ribbon to fit through. Thread one bead almost to the bend. Twist the two strands together and loop the cut ends back. Cut another length of wire about 5 inches. Also bend in half and start to twist together. At the midpoint, join it with the vertical piece, securing the two together with a couple extra twists. Thread your ribbon through the loop you created on the vertical piece. Thread a bead or two onto the ribbon. Wrap around the pitcher neck and fasten into a bow.